I have been baking a lot lately and today I am again posting a baking recipe. It is Honey Cardamom Cake. Two days back, there was a sudden invitation from a friend for lunch. So baked this cake to take with me. I wanted to bake a snack cake without frosting and was browsing for recipe, and when I came across this one, I was sure this is the one. The cake did not disappoint me. It came out really well- soft and delicious. Everyone loved this cake and I got lot of appreciations for it. Here I am today sharing this recipe with you. 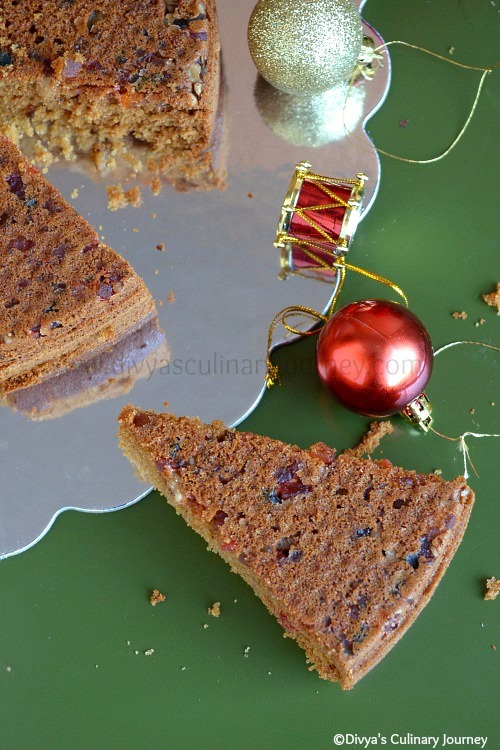 If you love the flavor of honey and the aroma of cardamom, then this cake will definitely win your heart. Pre heat the oven to 350 F. Apply oil and sprinkle flour on the cake pan. (you can use a bundt cake or 9*13 pan or two 8"/9" round pans). In a bowl combine together all purpose flour, baking soda, baking powder, salt and powdered cardamom and keep it aside. In another large bowl, whisk butter and sugar together. Then add eggs one by one and mix well. Then add honey and mix well. To this mixture, add flour mixture and warm water little by little and mix well. To the prepared cake pan sprinkle tutti frutti and nuts on the bottom and then pour the cake batter. Bake till the cake is done. The baking time varies with the type of pan used. I baked in two 9" round pan and it took around 25 minutes for me. Let the cake cool, then remove it from the pan, slice and serve. Adding Tutti frutti and walnut is totally optional. You can use any other dry fruit/ nut or just can skip it. If you want you can dust with confectioner's sugar, before serving the cake. I didn't do it though. While baking the cake formed a dome, so I just levelled it off and turned upside down to display the tutti frutti side. Baking time varies with the type of pan. for 9" round pan it took around 25 minutes, for 9*13 it will take around 40 minutes. I am planning to try some cake like this. I am sure you would have enjoyed the aroma that spreads to the kitchen while baking. Cake came out super well. Pictures looks so festive Divya. Love the combo of honey and cardamom. wow..cake looks soft and delicious. 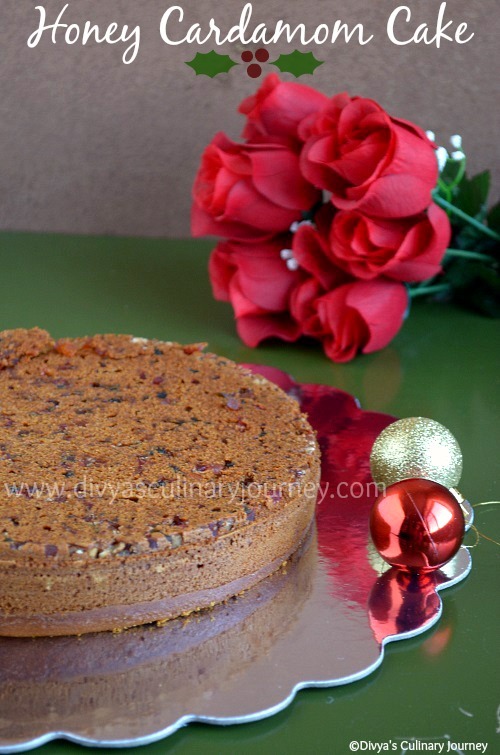 Super moist and perfect cake Divya. Can feel how aromatic and tasty cake it is! They look super moist and yummy.. Cardamom cake, divine smell!! Cake looks awesome and I can imagine the flavor..
Lovely soft cake.. looks awesome..
so beautiful clicks n the cake looks moist n yum! love the addition of tutti frutti in it. have to try it. Loving the combination. Even more delicious with the tutti fruittti. Super yummy cake dear......I tried this cake today and came out so well.... I will post this in my space with the link attached to your space. 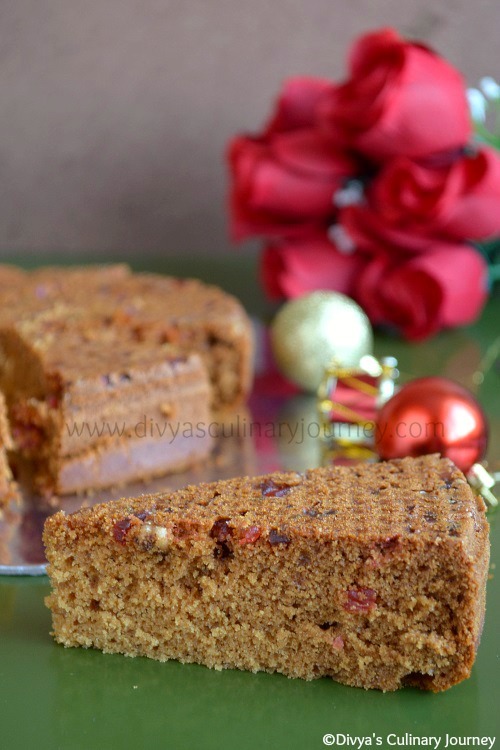 Thanks again for such awesome yummy n aromatic cake recipe. So so yummy and perfect cake..